Two very similar factions dull its edge, but Grey Goos old-school take on strategy still makes it one of the most interesting new RTS games in years. Hiding behind crumbling walls, my men are dying. Like the coward I am, I’m holed up in my base building myself a superweapon. Construction bots are crawling over my doomsday tank, the Hand of Ruk, welding this and inspecting that. The handful of soldiers I can afford to train buy me time with their lives. Just as a huge force shows up to end me, the Hand of Ruk groans and lifts off into a steady hover. Like a tranquilized bear it waddles in a circle, swivels its massive cannon toward the enemy, and fires. It evaporates two dozen enemies in one shot. It wipes out some friendlies in the blast radius, too, but I don’t have time to worry about that now. I’ve got a hovering death tank, and I’m going to blow up the whole goddamn world with this thing. Grey Goo understands why old-school RTS games were so much fun, and it’s a great expression of that classic design. Instead of demanding your attention in squad-by-squad fights, Grey Goo is won or lost at the strategic level—the victor isn’t the player who can command individual squads the best, but the player with the best supply chains and manufacturing pipelines. Grey Goo is at its heart an reinvention of the twitchy, high clicks-per-minute RTS that made the original StarCraft an e-sport. From the moment the fog of war clears I’m ordering units, calling in construction bots from orbit, and sending skirmish parties out to capture new resource nodes. Single-player missions are one-on-one scenarios and multiplayer skirmishes can accommodate teams or free-for-all modes for up to four players. In both modes, most games lasted between 20 and 30 minutes—though I did have one exhausting slugfest drag on for an hour. Campaign missions vary from basic battles to timed wave-defense modes, and I found them all well voice-acted and different enough to be interesting. The battles run on logistics. The strongest expression of this idea is a bold choice by developer Petroglyph: there’s only one resource, making Grey Goo an anomaly in the RTS genre. This energy source, Catalyst, is the basis for every purchase in the game, from building a new headquarters to upgrading a commando’s reload speed. By denying the enemy access to Catalyst, I deny them everything. Managing this resource is as simple as balancing a checkbook. A running ticker tracks my income and expenses in one number: positive means I’m mining more than I’m using, negative means I’m spending more than I’m bringing in. Unit production is similarly hands-off, with an option to auto-build any unit or series of units. A prudent commander will fine-tune production lines so that new units are constantly being built under budget, the Command & Conquer version of living within your means. My army grows along with my war chest, and I place new factories with my surplus. Grey Goo includes basic graphics sliders and toggles (detail level, vsync, bloom, depth of field, etc.) and a maximized borderless window option. It ran smoothly on my rig at 1080p on the highest graphics settings. I got a solid 50 fps during heavy battles, even with epic units and the particle effects cranked way up. If your PC isn’t quite up to spec you can still enjoy it by lowering the settings to the minimum, but be warned: the tiny individual units really lose definition at lower settings. The central conflict of Gray Goo is between the Beta, a humanoid race of hardy warriors, and high-tech future humans. Weirdly, the Beta have the most human-looking design: industrial buildings, walking mecha tanks, and dudes with rifles and backpacks slogging through the mud. The humans, on the other hand, never get their boots dirty from behind the controls of their hovering vehicles. The Humans and the Beta aren’t anything we haven’t seen in RTS games before, but they’re familiar in a good way: traditional RTS design that we already know is fun, revitalized in a modern game. The Beta use mobile base hubs to establish a series of standalone bases that each specialize in a different kind of unit. Roughly analogous to the British in Company of Heroes, these bases are both a way to move my production facilities closer to the front lines and another weakness for the enemy to attack and divide my attention. Humans are much more centralized—in our Company of Heroes comparison, these guys are the Americans. One central reactor runs power lines to every building and technology hub, making one central megabase with long supply lines stretching to the front. Though they are visually distinct, these two factions are extremely similar in terms of mechanics and unit trees. I don’t mind their strategic footholds being derivative of other games in the genre, but I would have liked to see more differences between these two armies. Especially in the early game, Human and Beta units are so similar that I had to consult the in-game encyclopedia to learn that their health, armor, and damage stats are actually different. Depending on your playstyle, either of these factions will be immediately recognizable and playable—a valuable mental toe hold for players to start trying to understand the third faction. The eponymous Goo are Grey Goo’s most interesting group and, unfortunately, the most tedious to play. Park a blob of nanobots, the “Mother Goo,” over a resource pool and they will self-replicate. The Mother Goo splits, mitosis-style, to form units or other Mother Goos that will set up on another resource pool and become its own production base. Petroglyph did a great job making the Goo unlike anything else in RTS. They’ve got some of the same swarm-tactics flavor as StarCraft’s Zerg and Warhammer 40k’s Tyranids, but their supply line infrastructure is unique. Their art style, too, sits in a creepy uncanny valley between mechanical and biological. But the Goo are also uniquely frustrating. Unlike the Beta and the Humans, there is no way to automate their unit production process. Instead, I spent my entire time with the Goo clicking keyboard shortcuts and ordering units. This blast of unwelcome micromanagement goes against what was, I thought, the entire ethos of the game. Grey Goo is strongest when it’s taking old RTS ideas and refining them, distilling them until the micromanagement is removed and pure, high-proof strategy is left behind. 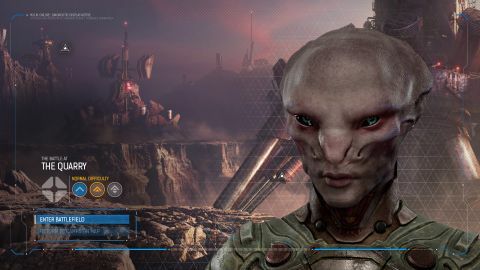 Though I wish that Petroglyph had taken more risks with the two humanoid factions, the inclusion of the Goo faction is a wildcard that might attract bizarre new strategies from expert players in competitive multiplayer. As a revival of a once-popular genre, Grey Goo excels. Everybody stand back and watch this. The Goo’s Purger unit melts enemy buildings on contact. Horrifying. In classic RTS style, everybody just stands in a row and shoots each other. The landscapes are varied, but Grey Goo plays out entirely in rural areas.